Galaxy Paradise is located within Block C of Sector 108. 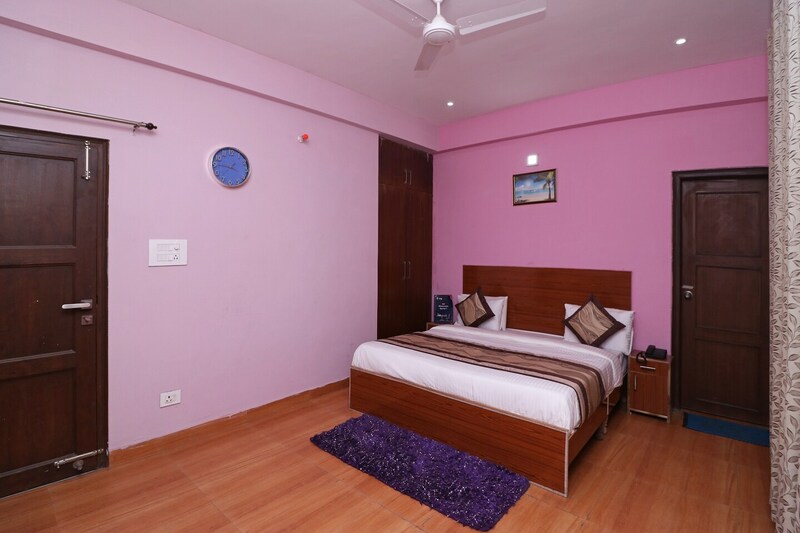 The hotel is quite popular among travelers visiting Noida and looking for comfortable accommodation facilities that can be booked without feeling a pinch in the pocket. All the rooms provided by this hotel have been decorated in an amazing manner. The rooms have been provided with large windows that are covered with brightly colored thick curtains. The rooms have been painted in bold and bright hues and a lot of wooden elements have been used throughout the rooms. The flooring provided is wooden and the rooms have a homely atmosphere. The rooms are extremely spacious and are well-furnished. The hotel provides a number of additional facilities such as free Wi-Fi, a constant power backup source, parking provisions, and CCTV cameras. The hotel is located close to a number of essential facilities such as the Indira Gandhi International Airport, Golf Course Metro Station, Police Chowki Sector 98 Bus Stop, Being Truckers, Burnout, Wabi Sabi, Dish TV Office, Orientcraft, and Nutrition Advisor.